WASHINGTON — Deciding to end a marriage is never an easy decision, and once you and your spouse agree to call it quits, it triggers a series of other decisions that can have implications long after your divorce is final. As a financial adviser and a Certified Divorce Financial Analyst, I have seen the emotional and financial toll of divorce many times. I also know the difference a really good divorce attorney can make in the financial outcome of someone going through a divorce. Once the Divorce Settlement is finalized, it’s simply too late to go back and renegotiate better terms. Given the expense and havoc that a divorce can wreak on a family, I generally recommend that couples who are separating in anticipation of divorce first attempt to work out an amicable agreement. This can be accomplished through a number of means including filing an uncontested divorce, hiring a mediator or following a collaborative divorce process. These are preferable to litigation since they save both time and money. However, there are situations where you may need to find an attorney to represent you. If that’s the case, then you should engage the best one that you can. Before I share my suggestions for finding a great divorce attorney, let me say that nothing will replace your involvement and engagement in this process. Too often, women leave key decisions to their attorneys, not fully realizing the financial ramifications until years and decades down the road. While your attorney is the expert, you need to be your own advocate by learning as much as you can about how your divorce will affect you, your children and your future finances. A good way to “know what you don’t know” is to download our “Moving On Post-Divorce” checklist. This is a very comprehensive list of “To Do” items once your divorce is final. By using this as a starting point, you can ask your attorney what, if any, of these items may relate to you and your situation. It also could spark conversations of things you haven’t considered as you maneuver through this process. When selecting a divorce attorney, interview two or three before making your final decision. While your friends or relatives may give you the name of a “good” attorney, you need to make sure the attorney and the firm are right for your particular situation. Come with a list of questions and weigh and compare the answers carefully before engaging someone. Is the attorney compatible with you? Daily or weekly contact with your divorce attorney is common, especially in the early stages of divorce negotiations. That’s why this question is at the top of my list. Most attorneys provide an initial consultation that is either complimentary or has a reduced rate. They typically won’t offer concrete advice, but rather will seek to understand your specific situation. • Do you feel comfortable sharing the intimate details of your situation? • Are you satisfied with the answers to your questions? • Does the attorney seem to understand your needs, or is a lot of explanation required? • Is the attorney’s typical client engagement negotiating a settlement or going to court? • What is the attorney’s primary way of communicating with clients (phone, email, meetings) and is that compatible with your preferred mode of communication? Your comfort level with the relationship is very important because your attorney will be working with you for an extended period of time — often well beyond legally finalizing the divorce. We often see cases where additional litigation or discussions with your attorney are needed to execute the final Divorce Agreement. It may take more time to finalize the separation of assets, especially if you and your spouse own complex investments, such as hedge funds, that are more difficult to liquidate, or when a qualified domestic relations order (QDRO) must be drawn up and reviewed by a retirement plan administrator before splitting retirement accounts. These situations can take time and may require multiple conversations between attorneys. I have unfortunately seen cases where an ex-spouse intentionally delayed separating the assets even after the divorce agreement was final. In one instance, my client could not get access to her money for months and her attorney did not advocate strongly enough for her to eliminate the unnecessary roadblocks. A good attorney will anticipate potential issues and work to avoid unsubstantiated delays. Does the attorney have relevant experience and is the attorney highly regarded? Divorce proceedings are heard in courts based on where the divorcing couple lives. Often, judges in a particular jurisdiction will be known for the nature of the opinions they render in certain divorce scenarios. There may be key attorneys who are highly regarded in these courts as well. It’s helpful to find out who your spouse is selecting to represent them (your opposing counsel). If that attorney is well-known or well-liked in the jurisdiction, you’ll want to consider hiring an attorney with the same stature to represent you. I suggest you simply ask any attorney you interview if he has experience working with your opposing counsel and how he’s successfully negotiated for the clients. The responses may reveal important insights about the attorney and the attorney’s skills. Are the fees in line with other firms? Most attorneys willingly provide a fee schedule in your first meeting. Be sure you understand it and ask questions if you are unsure about any aspect of the billing. Get clarity from the attorney on the upfront retainer, which often varies based on the expected complexity of the divorce. You’ll need to pay the attorney the initial retainer up front. Since it’s often thousands of dollars, it’s a good idea to set aside these funds as soon as possible to ensure you have enough money to engage your attorney of choice. Will the attorney collaborate with other professionals? 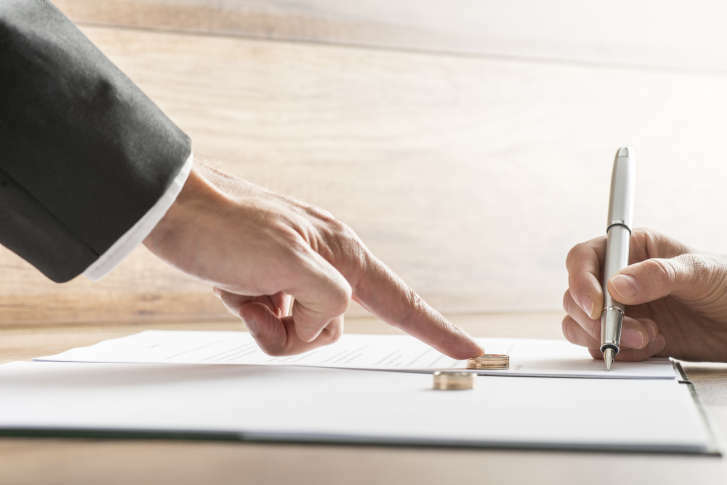 Having a good divorce attorney will likely help in the overall process, but an attorney is not a replacement for other professionals you should be consulting throughout the divorce process. Your existing CPA will be helpful in understanding your past and present tax situation, and you may want to engage your CPA for future tax projections. Similarly, if you’re working with a financial adviser, you’ll want to request updates on your portfolio values and seek advice on revising your financial plan. Engaging a Certified Divorce Financial Analyst (CDFA) is a good idea to analyze alternative settlement options and forecast the future financial needs for each party. Your divorce attorney won’t typically provide this type of analysis for you. Lastly, don’t disregard your emotional health. As a divorcee myself, I have experienced the stress and roller coaster of emotions that come with a divorce. I always advise my clients to talk to a therapist or personal coach. Their counsel and support will help to smooth out the emotional edges so that you can have a clear frame of mind to make important decisions about your personal and financial future. If you currently don’t work with any of these professionals, or if you prefer to engage someone new to advocate solely for you, ask your attorney whom they recommend. Some larger law firms have in-house professionals or advisers to whom they can refer you. Working with others experienced at dealing with your attorney can improve communication and may reduce overall fees. What resources are provided to educate you? In addition to hiring and relying on professionals with experience in divorce work, I encourage everyone going through a divorce to learn as much as as possible about the divorce legal process, understand your own finances and become aware of the specifics of your investments. As I mentioned in the beginning, having professionals to assist you is not a replacement for educating and advocating for yourself. I have found that the smoothest divorce situations are those where the divorcing parties are actively engaged throughout the process, manage their emotions carefully and thoughtfully assemble a team that serves their needs. Start by downloading our “Moving On Post-Divorce” checklist, then review it along with the questions you plan to ask when interviewing potential attorneys. During your interview, ask if they can recommend any books or resources to help you learn the basics about divorce and managing your finances. I believe the best lawyers will support your desire for education and welcome an empowered and engaged client. One final word of encouragement. You will get through this, but you don’t have to go through it alone. Have confidence that you will find the best advocates who will work diligently to provide the best outcome for you — starting with you. Dawn Doebler is a senior wealth adviser at Bridgewater Wealth, in Bethesda, Maryland, and co-founder of Her Wealth.